Well, we made the step this weekend into a big-boy bed. Lil' man seemed pretty excited and stayed in it all night. It was so cute...we were sitting there and he stopped and looked at me while we were talking about his new bed and he said matter of factly, "Thank you mommy." Just like he knew this was something new and big. It was the most sincere, sweetest little moment. With the new bed came new bedding of course. 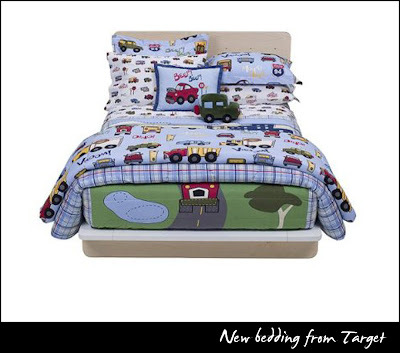 (mommy was excited) We went and picked out a new comforter and sheets at Target. He got to choose. Sports; basketballs, footballs, etc. or Transportation; cars, trucks, etc. He picked dars. 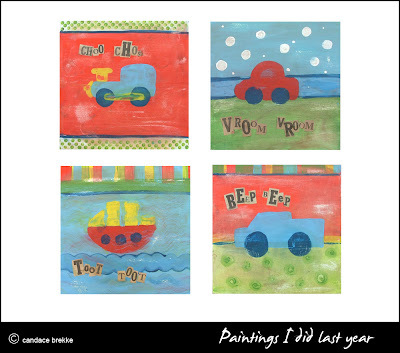 (he can't say his "Cs") Mommy was delighted at the choice, because it matches the paintings I did for him last year!! 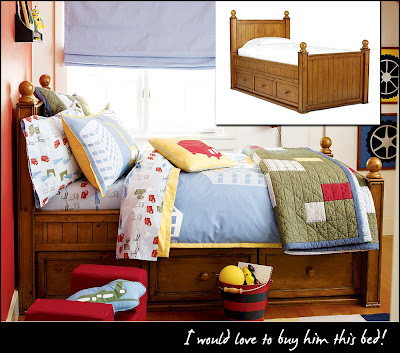 For now we are borrowing a headboard, but I found this set on PBkids that I would LOVE to get him. Too spendy, but perhaps I can find something similar locally. Very cute. Doesn't seem possible that he is ready for a big boy bed already.